Observed on a farm in Kamwenge, western Uganda, December 2012. From Wikipedia: The Southern Red Bishop or Red Bishop is a small passerine bird. It is common in wetlands and grassland in Africa south of the Equator. 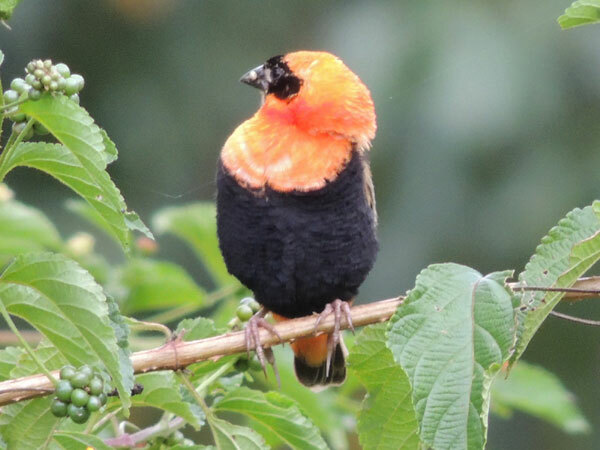 North of the Equator, it is replaced by the Northern Red Bishop or Orange Bishop (E. franciscanus) which was formerly regarded as a subspecies of this species. It is 10–11 centimeters long and has a thick conical bill. Breeding males are brightly colored with red (occasionally orange) and black plumage. The forehead, face and throat are black and the rest of the head is red. The upperparts are red apart from the brown wings and tail. The upper breast and under tail-coverts are red while the lower breast and belly are black. The non-breeding male and female have streaky brown plumage, paler below. Females are smaller than the males. It has various twittering calls and a nasal contact call. The male has a buzzing song. The Southern Red Bishop is found in southwestern Kenya, whereas the Northern Red Bishop is more likely in the rest of Kenya. Breeding males of the Northern Red Bishop have a red throat, black extending further back on the crown and long tail-coverts which almost cover the tail. The females and non-breeding males are almost identical to those of the Southern Red Bishop. Copyright Michael J. Plagens, page created 13 June 2013.